April 19, 1966: Bobbi becomes the first woman to run the Boston Marathon. The morning of the race her mother drove her to the start of the race in Hopkinton. Wearing her brother's Bermuda shorts, Bobbi found a clump of bushes as near to the start as she could. The men's race started. She waited until half the pack had left, then she jumped in and ran all the way to Boston, finishing ahead of two-thirds of the men. 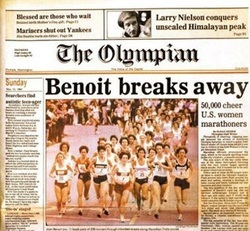 May 12, 1984: Bobbi is commissioned to “sculpt” the top three prizes for the first, second, and third place winners of the first Women’s Marathon Olympic Trials. Bobbi’s figurines stood just under two feet tall and were cast in three metals with the first place statue in gold, which was awarded to Joan Benoit Samuelson. Joan said, "But it's out [only running award on display in her home] because it's a real work of art." April 2001: Bobbi runs for ALS, a turning point in her neurological research career. April 2016: The 50th year commemorative celebration of Bobbi’s Run! Please see more on the 50th Celebration tab above.